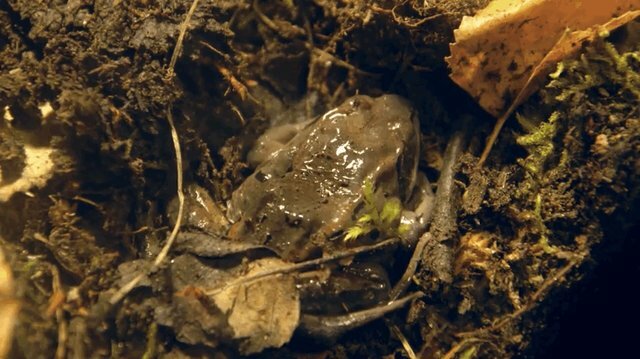 A spectacular time lapse taken by a researcher studying frog hibernation gives a close-up view of wood frogs freezing solid, thawing and, stunningly, coming back to life. This happens every year -- the amphibians simply hunker down to survive the -20 degree Celsius temperatures. Frogs in the wild stayed frozen for an average of 193 days. During this time, sensors showed that the temperature in their habitats averaged –6.3°C (21°F). At some points, temperatures dropped as low as –18.1°C, or just below 0 Fahrenheit. Despite the conditions, which were worse than anything recorded for wood frogs before, every frog survived. The research notes that frogs use the glucose in their tissues as a kind of natural antifreeze -- it protects their cells from the cold, so they can wake up and hop away every spring.